Denon AH-C710 review | What Hi-Fi? We're used to man-handling much larger, heavier kit from Denon, so it makes a nice change to be able to give our muscles a rest and attend to some lightweight in-ears. 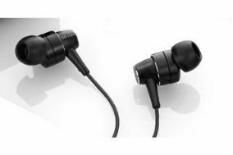 As with many comparably priced headphones, a selection of ear buds and a carry case are provided. The C710s come in either black or silver, and the driver housings are made from a hybrid material that Denon believes helps to produce the best sound possible. They also use a technology called a ‘Radial Cascade Damper' that reduces the effects of cable-transmitted vibration noise. In practice, the C710s deliver a pronounced midrange with plenty of detail, but there's a dearth of finesse and refinement. There's plenty of power and punch, but less subtlety. Listen to Rhianna's Unfaithful, and while dynamics are strong, her voice is afflicted by sibilance. These Denons don't represent a serious challenge to the class-leading buds.